Jamaica’s Foreign Affairs Minister A.J. 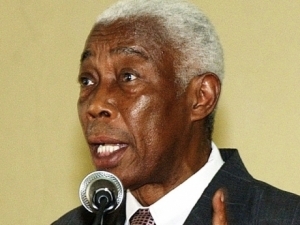 Nicholson says CARICOM leaders will continue to push for an end to the United States trade embargo against Cuba. US President Barack Obama last month announced new trade and travel policies with Cuba as part of an attempt to normalise relations with the communist regime there after nearly 50 years of punishing economic sanctions. Obama also used his State of the Union address on Tuesday to urge the American Congress to begin lifting the embargo against Cuba. Addressing a reception this week marking the 56th Anniversary of the Triumph of the Cuban Revolution, Nicholson said regional leaders will continue to call for an end to the embargo even as they welcome the move to restore diplomatic ties between the US and Cuba. He says Cuba has shown the world that despite continued economic and financial hindrances much can be accomplished by effectively utilising one’s limited resources. Nicholson said Jamaica is looking forward to the tangible benefits that the US re-engagement with Cuba will bring Jamaicans and the people of the Americas.